We each have a story that includes a past, present, and a future. The Bible also tells a story; a narrative of historical events full of significance for all of humanity. As those united to Jesus, we are made participants in God’s story and cast as characters in the drama of redemptive history. The resurrection of Jesus is one of those climactic moments in both Jesus’ life and the Bible’s story of God redeeming a people and restoring His corrupted creation. When we think of Jesus’ resurrection we should consider the past accomplishment, the present effects, and the future realities dawning upon us. As participants of the story through union with Christ, we must see how the resurrection rewrites our past, remakes us in the present, and reshapes our future. Jesus’ sacrificial death and triumphant resurrection stand at the center of the “good news” Christians stake their lives upon. The Bible joins the bloody cross and empty tomb as two distinct but inseparable events. And yet, many of our gospel presentations and theological conversations refer to the cross as the place where salvation was fully accomplished and the deal was sealed. Christ’s resurrection is either left out or tacked on as the cherry on top. I’m thankful evangelicals have been “cross-centered” but it’s unfortunate we’ve moved the resurrection to the periphery. This coming Sunday begins what the Church has called Holy Week or Passion Week. The time from Palm Sunday to Easter (Resurrection) Sunday has provided Christians with a week to give special attention to the person and work of Christ. It interrupts our normal rhythms and intentionally puts Jesus before us so we can reflect on the events leading up to and including his sacrificial death and triumphant resurrection. Below is a reading plan for the week, as well as activities and resources to help you leverage this significant week in the Church Calendar. 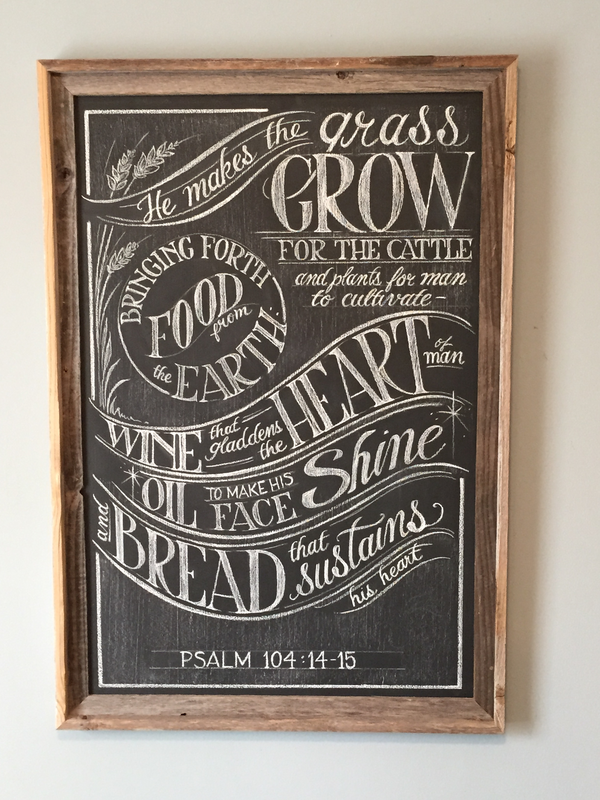 In our kitchen we have this framed chalk art in the image to the left. “You cause the grass to grow for the livestock and plants for man to cultivate, that he may bring forth food from the earth and wine to gladden the heart of man, oil to make his face shine and bread to strengthen man’s heart” (Psalm 104:14-15). It’s a reminder that food and drink are both God’s provision to care for us but also an evidence of his goodness in giving us food to add to our happiness. God wants us to enjoy our food, our drinks, and our feasts! The Bible describes feasting in very positive terms—although there are obviously times where it’s corrupted or misused like all of creation. It seems God created us to thoroughly enjoy food as a gift but also to prepare our hearts and minds for something even more satisfying.